The early 2000s were packed full with anti-authority action games, such as Tony Hawk’s Underground and Jet Set Radio. While this style of games have all but died out in recent years, Fusty Games looked to bring back the genre with Hover. Hover takes place in the futuristic utopia ECP17, where the planet has become a dictatorship and all fun has been outlawed. You must join the rebel group, the Gamers, to fight against the Great Admin and to free the people from his oppression. While you may have heard this story a thousand times already, there are plenty of unique elements that really make it stand out from the crowd. The highlight of this game, as it should be, is its gameplay. You can grind on any surface, drift around corners, run on walls, jump insane heights, and the list goes on. The controls are tight and accurate, perfectly matching the gameplay needed for a fast-paced parkour experience. For the most part the controls feel solid, and indeed that’s exactly the case while exploring a large and open environment. However, the come up short when it comes down to precise platforming. Your character is somewhat slippery, which makes it difficult to pull off certain jumps without falling off narrow platforms. Not to mention that you may end up going so fast that you’ll slip off the platform when you land on it. Thankfully the developers thought of this issue, and with the press of a button you can rewind your character back to the platform you were previously on. You can only rewind up to 5 seconds in time, but that feature is truly a saving grace. The controls also don’t seem to work so well in tight spaces. This game has a few stealth missions that require you to sneak around. When your character launches forward at 20 miles per hour with a single flick of the analog stick, several issues crop up. The camera can get a bit wonky in close quarters, which can add to the frustration, especially when you’re trying to avoid security cameras. While it’s great that you can press a button to sneak around at a slow pace, there are often time limits that must be met or the mission fails. If you are seen by security they’ll send out a drone to capture you and three strikes and you’re out. Shoehorning stealth missions into games is never a good idea, and that’s especially true here. Thankfully these types of missions aren’t overdone and many of them are optional. This game also shines with its level design. There are five stages, and each one is perfectly crafted for you to run around in and have fun. You’ll start the game in what is essentially a hub world, though it’s still a level in its own right. You’re free to explore this large city for hidden collectibles and to take on a vast assortment of side missions. After meeting certain requirements (like leveling up your rank from completing side missions) you’ll be able to access other levels. These range in variety and include places like the high security prison, maze-like sewers, and even a towering city that’s far larger than the one you begin the game in. Each area is perfectly designed around the abilities you have at your disposal, allowing you to reach a certain area in hundreds of possible ways, which keeps the game feeling fresh. The game is designed like an MMO. You’ll start by creating your own custom character, and running through a quick tutorial level. From there you’re tossed into the world to start accomplishing any side quest of your choosing. As you complete these tasks, you’ll gain EXP as well as increasing your rank. While your rank doesn’t matter for anything besides accessing new levels, gaining EXP is very important. Your character has a level system in the form of a grid. Here you can equip items you either earn or find to raise your character’s stats to do things like increase your running speed or give you a higher jump. As you level up you’ll open up new spots on the grid to enhance your abilities even more. When you reach certain levels, you can also equip a new graffiti style or a new pet that follows you around. Hover also has an online mode, which allows you to play through the story, side missions, etc. with your friends. The game plays just as smoothly in online mode as it did offline, meaning there was no lag or delayed inputs. You can also join other players in side missions to play with or against them. While you can play the game solo just fine, the game does feel more satisfying when you have several players zooming across the map. While the MMO style is done well in some aspects of the game, the options are very limited. Your character is pretty basic and all you can do is change the color of the outfit you are wearing. Even games like Splatoon 2 thrive around buying and obtaining new clothes, which is strangely absent here. There’s also a lack of connectivity for the online community in Hover. There are no leaderboards, events, or online exclusive areas. It’s as bare bones of an online mode as it could possibly be and ultimately the online portion seems sort of tacked on at the last minute. Although the game excels in a few areas, it definitely falls short in others. One of the worst parts of the game is the Gamerball Challenge. It’s a futuristic sport that requires you to grab the ball and try to toss it into the goal. There are various options of play here, ranging from a normal game, to a race, and even trying to collect as many Gamerballs as possible within the time limit. The problem is that the goals are extremely small so you have to have incredible throwing accuracy to score. Since the game is so fast-paced this becomes more difficult than you can imagine, and when you add in a time limit on top of that whereby you have to start the entire mission over if you fail it’s a recipe for disaster. This game also suffers from a few quality of life issues that damper the experience. For example, when you want to restart a mission you have to wait for the game to teleport you back to the person who assigned it and then sit through the entire dialog again before starting over. Then there’s the lack of instructions before some of the missions, which never fully explain what type of mission they are and leave you to fend for yourself. This leads to having to play many missions more than once because the first time is just trial and error. While I’m not a fan of handholding in video games, I do think you should at least give your players some idea of what they need to do. On a brighter note, this game does have some fantastic music. There are a variety of tracks for each area in the game, some of which are so good that you’ll still have them playing in your head even after you’re finished playing. What’s great is that the game has a few tracks composed by Hideki Naganuma, composer of the soundtrack for Jet Set Radio. While I may have come across a bit harsh with some of my criticisms, the end result is still a game worth playing. 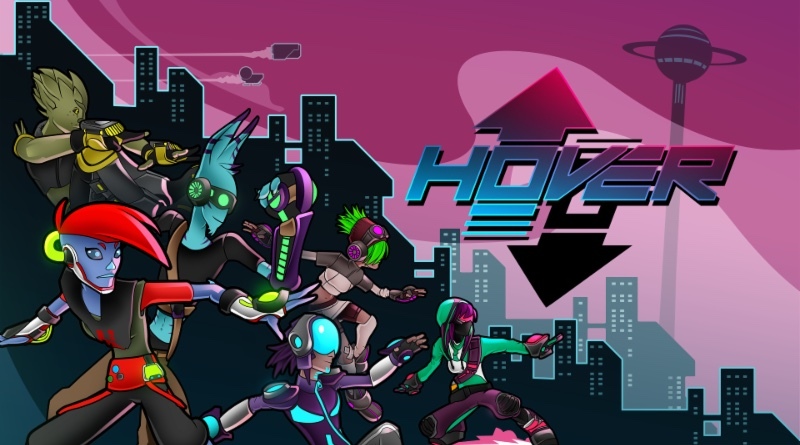 I had a lot of fun spending time with Hover and the underlying gameplay is great. The various stages and ability to explore the hub world provides plenty of hours of entertainment, whether you’re playing solo or online with a friend. For those craving the colorful parkour experience, you’ve come to the right place. Hover: Revolt of Gamers plays fantastically and it has a kicking soundtrack. While there are some issues with the structure of the game, it doesn’t ruin the overall experience.